Weird right? Why does Haskell have this? Using “$” can make Haskell code more readable as an alternative to using parentheses. It has other uses too, more on that later. 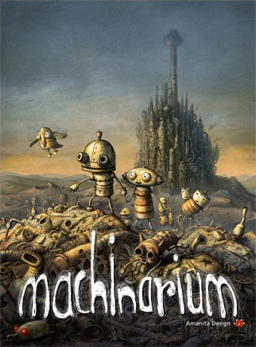 Machinarium is a puzzle point-and-click adventure game developed by Amanita Design. Machinarium was developed over a period of three years, by seven Czech developers, who financed the project with their own savings. The marketing budget for the game was a scant $1,000. The game was in development for the Xbox 360 platform for a period of six months; however, Microsoft, whom the developers had approached to publish the title on Xbox Live Arcade, ultimately decided not to do so. Microsoft does not allow games to be released on Xbox Live Arcade without a publisher attached to the title, and the developers were reluctant to approach a third party to publish the game, as this would mean that profits for the developers from sales over Xbox Live Arcade would be greatly reduced. Subsequently, Amanita Design approached Sony, whose policies do allow for self-publishing on the PlayStation Network platform, and have submitted the game to them for approval, in order to release the game on the PlayStation Network. Tesla died on 7 January 1943 at age 86 from heart thrombus, alone in room 3327 of the New Yorker Hotel. Another influential book was a biography of Nikola Tesla, the brilliant Serb scientist; though Tesla’s contributions arguably matched Thomas Edison’s — and his ambitions were grand enough to impress even Page — he died in obscurity. “I felt like he was a great inventor and it was a sad story,” says Page. “I feel like he could’ve accomplished much more had he had more resources. And he had trouble commercializing the stuff he did. Probably more trouble than he should’ve had. Perhaps most important, information can flow through even the remotest of villages, thanks to the massive increase in mobile telephones across regions that just a few years ago had no phones at all. Mobile connectivity and the spread of wireless broadband are greatly strengthening rural health systems. In all of the Millennium Villages, and in more and more villages around the continent, lay community workers are bringing health services from the clinics right to the community. Mobile phones are critical in supporting these outreach workers, enabling them to call the doctors and nurses for advice, summon an ambulance or connect to a computerized expert system via text messaging. Albert, whom the novel identifies as Chris’s guardian angel, explains that Summerland includes many things which inhabitants do not need — such as automobiles — but which exist simply because some people believe they are needed. The particular Heaven of each religion exists somewhere, because that is what members of each religion expect. To be catalyst is the ambition most appropriate for those who see the world as being in constant change, and who, without thinking that they can control it, wish to influence its direction. Every computer game is a programming language. Playing computer game is an act of programming. What kind of game do I really enjoy? The best game I have seen are designed by people [who] design it for [them]selves. Through the reading of popular scientific books I soon reached the conviction that much in the stories of the Bible could not be true. The consequence was a positively fanatic freethinking coupled with the impression that youth is intentionally being deceived by the state through lies: it was a crushing impression. Wikipedia, which just recently celebrated its 10th birthday, is astonishing in its breadth and scope, but there’s only so much that any encyclopedia, limited to verifiable facts about discrete nouns, can capture within the entirety of human knowledge. On the other end of the spectrum, sites like Facebook and Twitter allow people to describe their lives and to make personal observations, but on such networks it’s hard to separate the informed opinion from the pure speculation. The large expanse between the two approaches — the purely objective and the purely subjective — is the terrain that Quora hopes to occupy. The early leader in social networking, Friendster, had terrible technology. The advertising-heavy MySpace, which dethroned Friendster, was a bit like Yahoo Answers: chaotic and low-rent, prone to spammers and scams. Yet both were immensely popular — until Facebook came along and figured out how to do social networking right. — Does Quora Really Have All the Answers? After the arrest of Bee Sting, Phoenix Jones and of course the ever-present and looming implications of the Trayvon Martin case, we feel that it’s time to bring the power back where it belongs: The People. We will be launching a fully functional website on June 1st, in tandem with a physical tour in which we contact each and every PD Community Affairs office and established Block Watch in our respective cities and organize meetings. These meetings will introduce the site, give a tutorial, and drop off our PowerPack… a brief list of solid, low cost resources for initial training and resources to get people started, or to give them momentum to continue their efforts to protect their loved ones and their neighborhoods responsibly. From there, they can use the website to report crime anonymously, track crime patterns, build block watches, trade skill training between professionals and communicate with each other and their precinct’s Community Affairs offices. In addition, we will be building strong communication and trust between not only ourselves and the community, but as we move from neighborhood to neighborhood, the community itself. As they teach and learn from each other, they will build confidence in themselves and their skills in practical self defense, medical assistance, legalities and most importantly for this kind of work, non-violent communications.